We are a leading Manufacturer of pressure vessel from Kolkata, India. We are having expertise in Horizental & vertical Pressure Vessel manufacturingfrom 0.5 to 30 M3 capacity. In different quality of material IS:2002, IS:2062, IS:6911, IS:5522 with relevent MTC . We are having certified welder . We mainly supply to Linde India Ltd, L&T , F. Harley , ALSTOM India etc our esteemed customer . We are having all testing facilities of air receiver tank e.g. DP test, Hydroulic Test, Radiogarphy test. Also supply all relevant accessories like foundation bolt, Pressure guage, Pressure switch, valves along with MTC. 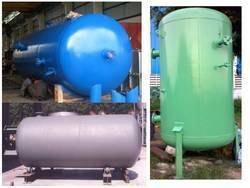 We are having facilites of designing & manufacturing of pressure vessel according to your customized requirement. We are having separate team for erection & commissioning of the same .